The Composites Leadership Forum (CLF) is working to influence the Government and other bodies (including Industry, research centres, academia, skills provider) to bring together support for composites and ensure growth and industrial success for the UK. It is chaired and led by industry; the current Chair is Alex Aucken of Solvay Cytec. The CLF was set up in mid-2012 from an industry initiative to coordinate and connect the activities of the growing number of composite-using companies, supportive stakeholders and industry organisations. 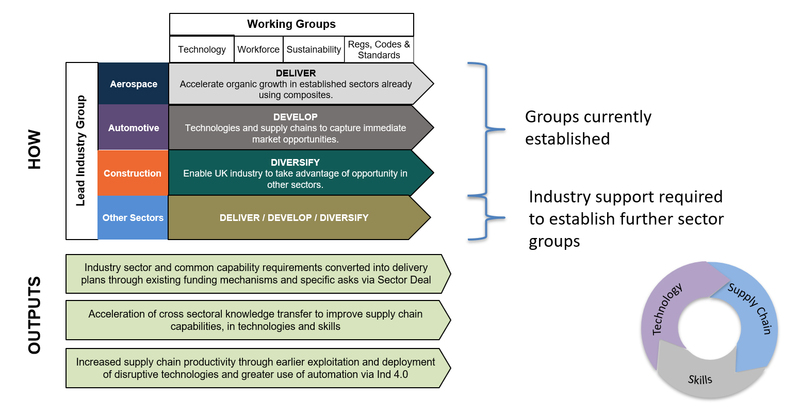 Fully supported by BEIS, the CLF is chaired by industry with members drawn from industry sector groups, Government and stakeholders and delivery partners. Composites UK, HVM Catapult (represented through NCC), British Composites Society, IMechE, KTN Ltd, NPL Ltd and CIMComp. Aerospace Growth Partnership, Automotive Council, Motorsport Industries Association, Construction - Composites UK CSG, Renewables UK, Defence, British Marine Federation, Railway Industry Association, Materials Supplies and People - ESG. Download a copy of the UK Composites Strategy here.